Shoes are one of my favorite ways to inject a little fun into my wardrobe; a funky pair of shoes can change up an entire look. However, in the winter I feel like my shoe-game really plummets. The weather dictates my choices, and as a result I'm usually beyond sick of boots by the end of March. I relish in those days I can pull out the flats and mix things up (like on these days) but for the most part I live in boots and warm socks from November to April. Here's how I styled them for both work and the weekend. Linking to Mix it Mondays and Inspiration Monday. I've noticed that on a few of the food blogs I love, they'll add what they made on the same day 1 year ago, 2 years ago, or more. I love seeing that! So in the spirit of that, I thought I'd also add this to the bottom of my blog posts when I can. I've been blogging for going on 5 years now (! ), and it's fun to look back at some of my old (and sometimes questionable/entertaining/poorly photographed) looks! 3 years ago: a look inspired by a book: Cutting for Stone. 4 years ago: a favorite skirt with oxfords. 5 years ago: classic stripes + missing feet. Okay, get ready for a lot of love... love the boots, love how you made them for work, love love love the layered plaid and stripes. Knocked these looks out of the park! And I'm so impressed you can do a 5 years ago today link! Also love that you did a book-inspired outfit - such a good one. I agree with Anne--both looks are fabulous and I'm really liking that plaid dress on you. Do you read Seersucker and Saddles? She just did a post with that dress in three ways. I also really enjoyed seeing you 5, 4 and 3 years ago--it's a great idea and I hope you keep up with it. Do you still have that mustard skirt? That looked so cute on you. Gosh that cardigan looks cozy! 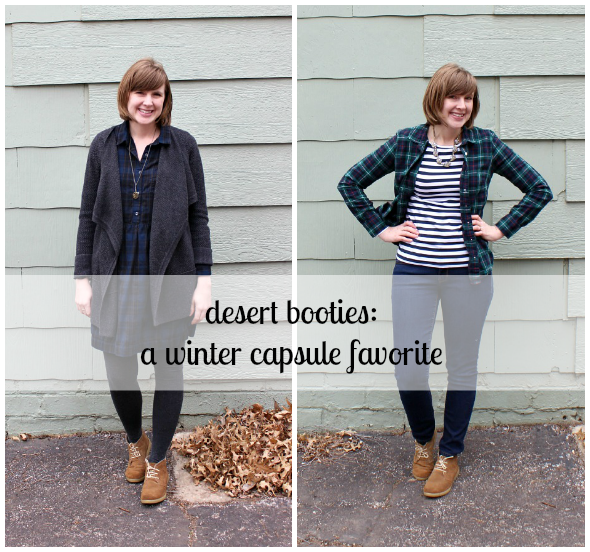 I love how you styled your booties! I wear my black wedge pair whenever I'm dressing up a bit. I would like to find a flat pair like yours that I can wear all day. They're hard to find! They are super cute shoes! They're a great find! Also love the idea of what you blogged on this day several years ago, I am on year number four but that could be fun to do sometime! Both of these outfits are gorgeous! The first looks SO cozy - now I really want a plaid dress. Thanks Anne!! I'm so glad I found these boots--they really have been the perfect in-between boots/flats shoes. And I can't believe it's been over 5 years...crazy. It was fun (and a little scary) looking back at old posts. Thanks Megan! Yes I LOVE Seersucker & Saddles...I can't wait to check out that post, she always has great style! And yes, I do have the skirt still. I didn't include it in my last couple of capsules because I had worn it so much the last couple of falls/winters I needed a little break from it I guess. But I do really like it and will definitely keep it. Thanks Rebecca! I've been surprised to find that this dress is really versatile. I'm glad I found it! I love those booties too! They look amazing on you!